stalemate: Brighouse Town's Luke Parkin tries to get an attack going in Saturday's clash against Mossley. Brighouse Town manager Paul Quinn admitted his team weren’t ‘at the races’ after they drew with Mossley at St Giles Road. The hosts took an early lead but were pegged back before the interval, although they remain top of the Evo-Stik First Division North. Quinn said: “We weren’t quite at the races. “We started off well, but after scoring early on we seemed to drop the pace and it worked against us. “The lads are disappointed we haven’t won. We weren’t as fluent this week, perhaps the long trip in midweek took its toll, and although we aren’t pleased with the performance, its still a point”. Town were one up after six minutes with some fancy footwork and play from Luke Parkin who passed to Leon Osbourne who then found Ruben Jerome to the right of goal who planted the ball in the back of the net. Town continued to dominate the game and in the 30th minute Jerome headed the ball on target, but it was cleared by Mossley goalkeeper Liam Flynn. In the 36th minute Mossley levelled the scores when a free kick by Callum Warburton was latched on to and headed into the goal over Tom Taylor by Kyle McGonigle. Just before half time, in the 43rd minute, Parkin was one-on-one with Flynn and he lobbed the ball just wide and it was in at the break 1-1. Two minutes into the second half the ball fell to Stephen Mallory 30 yards out, straight in front of the goal, and his blistering shot was punched out by Flynn. In the 57th minute Town brought on fresh legs with James Pollard and Ryan Watson replacing Adam Field and Tom Haigh. Mossley then took a shot on goal through former Bury player Tom Pratt but Town keeper Taylor tipped the ball over the bar. In the 65th minute Taylor then saved another shot with his legs, again from Mossley’s dangerman Pratt. Daniel Bunch came off the bench in the 71st minute to replace Mallory. 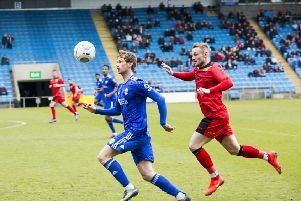 Pratt came threatening again in the 74th from a Bunch blunder that saw the ball deep in the Town half and Pratt saw his chance, firing the ball on target, but Taylor cleared the danger. It was straight down the field to the Mossley goal a minute later when Kyle Harrison blocked Parkin’s attempt that looked to be heading for the back of the net. In the 78th minute Osbourne sent the ball flying over the crossbar from a good position. With two minutes to go Town tried another attempt on goal but Watson’s shot had too much spin on it and the ball went wide of the goal. Mossley responded, and after several attempts on the Town goal, sub Damase Kiwanda sent the ball skimming across the face of the goal and out the other side to the relief of Town players and their supporters. As the game went into added time two yellow cards were given to Watson and Mossley’s Mark Haslam for an altercation on the field. Greg Pearson took the free-kick awarded to Town but nothing came of it. Brighouse Town: Taylor, Field (Pollard), Pearson, Illingworth, Hewitt, Atkinson, Mallory (Bunch), Haigh (Watson), Jerome, Osbourne, Parkin. Subs not used: Hall, Low. Mossley: Flynn, Harrison, Haslam, Jeffs, Benjamin (Bourne), McGonigle, Warburton, Hill, Bove (Gosling), Short (Kiwanda), Pratt. Subs not used: McDonnell, Harper.